SNAFU Dance Theatre’s Ingrid Hansen answers some questions about Pretty Little Instincts. LR: What inspired you to create Pretty Little Instincts? IH: It’s really hard to say specifically – I think we’re inspired and influenced by everything we take in on some level. I actually started brewing this show while on a cross-Canada theatre for young audiences tour – even though Pretty Little Instincts has nothing specifically to do with youth. I was dealing with the wildness within myself, watching the people around me suppress their own instincts and intuition – and things began to grow. A bit like the mould growing out the damp walls of the apartment we’re staying in here in Toronto. It just erupts. Then spreads. Then you breathe in the spores. I’m not sure where I’m going with this metaphor but let’s pretend it’s really profound. LR: How are you adapting to the space at Fort York? IH: We use the huge sloping walls of the Fort, the deep grassy moat, and a wall set with huge wooden spikes. We also use the bats flying overhead, the gophers, the wind, the rain. . . we’ve been performing outdoors rain or shine, with the audience snuggled under tents as the rain gradually washes away the actor’s bodypaint leaving us mostly washed clean by the end of the show. It’s an incredible, huge, raw open space. LR: Can you describe the creative process for Pretty Little Instincts both at its inception and as you’ve taken it to new spaces? IH: We have two brand new cast members, Seth Drabinsky (Toronto) and Heather Lindsay (HerebeMonsters, Vancouver) in this inception and the show has evolved a great deal – especially the characters. The space itself was a huge influence. We are still taking it in every night with each performance. LR: In three sentences or less, what is SNAFU all about? 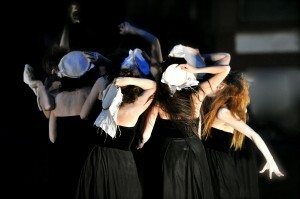 IH: Renegade Outdoor Dance Theatre. IH: Who wouldn’t want to? We have only a few performances left and we’re out there RAIN OR SHINE. We’re performing tonight (Wednesday) 10pm and Saturday 930pm, RAIN OR SHINE, and we have cozy tent cover for the audience.